Rajshri Productions was the ever first production house to make a film purely on friendship back in 1964. Dosti was about the friendship between a lame and a blind boy and it was a roaring musical success . Since then, Rajshri’s films has always revolved around the concept of friends and family. In 2019, Rajshri is back with a film which showcases the importance of friendship but with a twist! *Hum Chaar is based on the concept that in today’s world, friends become family too! Combining two eternal bonds of family and friendship, Hum Chaar is the next offering from Rajshri, upholding the values that Rajshri has stood for, for the past 71 years! The film explores the idea that in a world where families are nuclear and joint families are rarely seen, friends are family too. 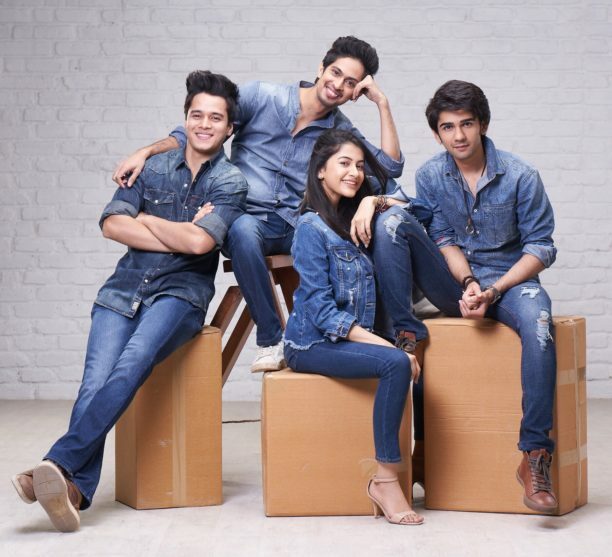 Debutantes Prit Kamani, Simran Sharma, Anshuman Malhotra and Tushar Pandey will be seen in lead roles. Rajshri Productions’ upcoming and much anticipated film “Hum Chaar: Friends Bhi Family Hai” is slated to hit the screens on 15th February 2019! 15 queries in 0.327 seconds.